Tungsten copper (W/Cu) submounts with pre-deposited AuSn, for mounting of laser diode bars and arrays. The laser bar will usually need to be closely aligned with one edge of the submount. Standard edges are as machined. For critical applications one edge can be made super sharp. Various metallisation schemes can be applied. The standard coating is vacuum sputtered Ti/Ni/Pt/Au. 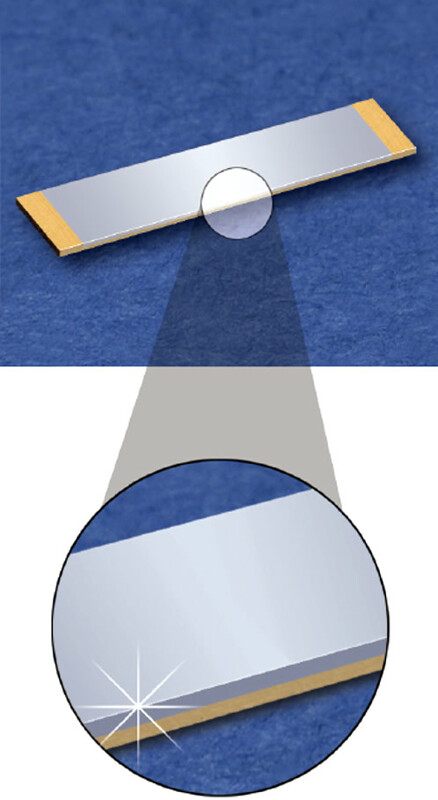 A thin layer of vacuum deposited AuSn can be applied over one or both of the top and bottom faces. The standard alloy ratio is nominally 76 Au/24 Sn, normally at ~3.5 – 5.5 microns thick. The alloy ratio can be tailored for specific applications. The solder layer can also be wrapped over the critical edge to aid solder wetting and minimise solder balling in front of the laser facet. Use the links on the left for details of our capabilities in manufacturing patterned AlN laser mounts together with sharp edge C-mounts, photodiode mounts and other optoelectronic and RF related products.